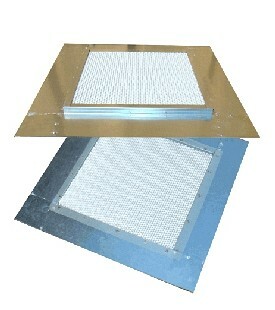 PRODUCT: VULCAN 20" X 20" FIRE STOPPING DORMER VENT BASE FLASHING. PRICE/EACH. SIZE: 20x20" Overall square flange. Inside vent area is 13.5x13.5" (3.25" flange all around vent area). 105 Sq. Inches Net Free Vent Area. Provide a fire stopping base flashing (sub-flashing) for most all types of roof mounted vents, including dormer vents, eyebrow vents, box vents and more.